to get instant updates about 'Beacab Gems Inc.' on your MyPage. Meet other similar minded people. Its Free! 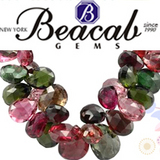 Beacab Gems Inc. launched Beacab.com as a sales and marketing platform in order to display 100% of the company's offline inventory to its current database of designers, retailers, and jewelry enthusiasts. Precious gems like rubies, emeralds and sapphires are available on Beacab.com in a variety of shapes, colors, sizes, dimensions, designs and at attractive price ranges to fit every need and every pocket. Ruby, sapphire and emerald beads, cut stones, both faceted and cabochons, briolettes and carvings are in stock here. Different shades of rubies ranging from deep reds to subtle rose, a range of colors of sapphires (blue, yellow, Padparascha, white) and myriad qualities of emeralds are available at Beacab.com. The company hopes to offer unique products and services to new customers as well. No matter what the sourcing requirements, Beacab.com’s vast and varied inventory is sure to find an offering that suits jewelers, jewelry designers, and jewelry enthusiasts. The website aims to be user-friendly across services and accessibility and is keen to offer the best customer experience to its online patrons. We especially ensure that the depictions of products on the site remain as close as possible to their true color and form hence avoiding any special alterations or malpractices for its online visitors. Beacab Gems Inc. the gemstone beads & diamond beads wholesaler, presents natural colored diamond beads in black, white, blue, brown, yellow diamond beads etc.